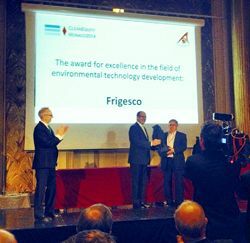 Frigesco's flash defrost system for cold rooms and refrigerated cabinets has won a prestigious international award at Clean Equity Monaco 2014. The patented technology can reduce annual running costs for refrigeration systems by up to 25 per cent, plus extend the life of plant, safeguard food hygiene, and improve health and safety for store employees. The innovation has been developed by a team headed by Professor Tom Davies. It beat 22 rival entries from 11 countries to win the top accolade for Excellence in the field of Environmental Technology Development. David Walter, managing director of Frigesco, was presented with the award by His Serene Highness Prince Albert II of Monaco. The international accolade is the latest in a string of endorsements for Frigesco's pioneering flash defrost technology. The company was awarded a Department of Energy and Climate Change (DECC) grant last year, and invited to participate in Cleantech Innovate, the leading UK green technology event, backed by DECC and the Institution of Mechanical Engineers. Its presence there led to an invitation to present the innovation in Monaco. Bob Arthur, former president of the British Refrigeration Association, and a respected authority on retail refrigeration, has joined the Frigesco team to help develop and commercialise the technology.